Love, Joleen : Guest Blogger | Eat. Drink. Love. Guest Blogger | Eat. Drink. Love. Hello Love, Joleen readers! My name is Stephanie and I blog over at Eat. Drink. Love.. I’m here today to post for Joleen while she is moving. My husband and I just recently made a cross-country move so I know how hard that can be (and she has a baby!)! Joleen and I go way back. Like way back. We first met in high school many moons ago. It’s been so nice to keep up with Joleen through Facebook and her beautiful blog! I was so glad when she asked me to mix up a recipe to post for her! As many of you probably know through reading Joleen’s blog, she has recently been put on a dairy-free diet since having her sweet little baby, Ben. I’m always up for a challenge so I wanted to make something that would typically use dairy. I had a bunch of bananas and strawberries sitting around that were about to go bad so I wanted to put them to good use! 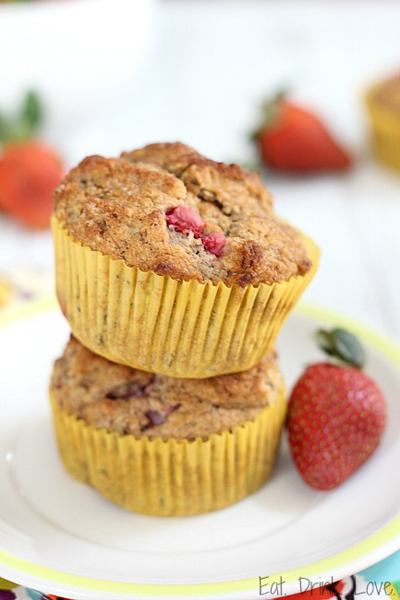 I came up with these fruity and hearty muffins. I didn’t put too much sugar in them so they are perfect for breakfast or a snack and are also kid-friendly! I hope you enjoy them! 2. In a large bowl, sift and mix together the flour, baking powder, baking soda, cinnamon, and the salt. 3. In a separate bowl, mix together the mashed bananas, brown sugar, coconut oil, and the applesauce. 4. Make a well in the center of the dry ingredients. Pour in the wet ingredients and fold into the dry ingredients until everything is just combined. Fold in the strawberries. Do not overmix! 5. Line a muffin tin with muffin liners. Lightly spray them with a bit of cooking spray. Scoop the batter into each mold until each is about ¾ of the way full. Sprinkle some turbinado sugar on top of each muffin if desired. 6. Bake for about 13-15 minutes until lightly browned on top and a toothpick inserted comes out clean. Thanks for having me today, Joleen! Best of luck on your move! Loving everything about these muffins! Especially that they are whole wheat and rather healthy. Good luck with the move, Joleen! I love your blog! 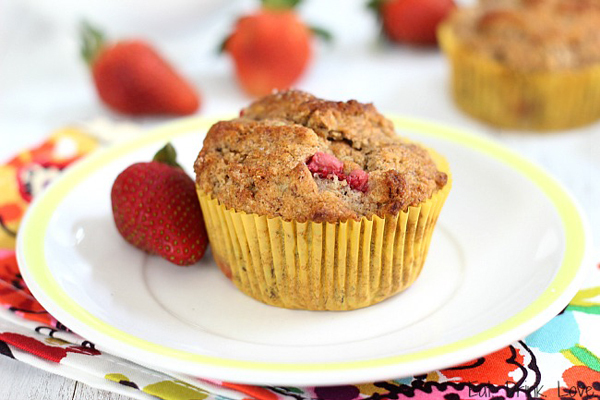 Lovely muffins and beautiful blog! Wow! I am very impressed! Thanks for sharing. They look yummy.